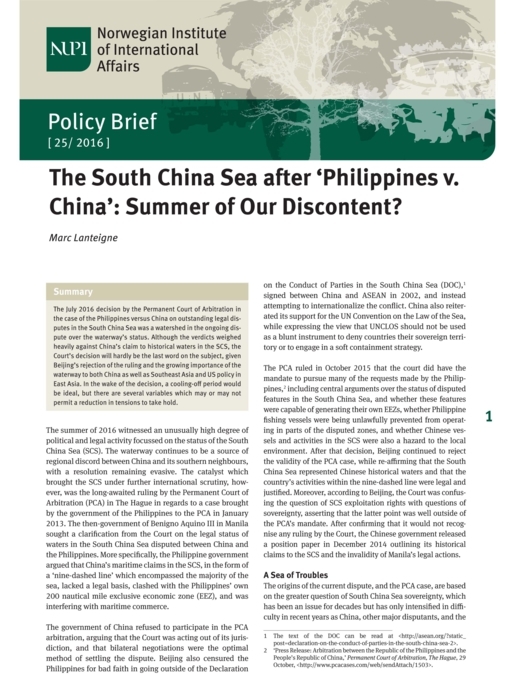 The July 2016 decision by the Permanent Court of Arbitration in the case of the Philippines versus China on outstanding legal disputes in the South China Sea was a watershed in the ongoing dispute over the waterway’s status. Although the verdicts weighed heavily against China’s claim to historical waters in the SCS, the court’s decision will hardly be the last word on the subject, given Beijing’s rejection of the ruling and the growing importance of the waterway to both China as well as Southeast Asia and US policy in East Asia. In the wake of the decision, a cooling-off period would be ideal, but there are several variables which may or may not permit a reduction in tensions to take hold.